Behind my mask of foundation, concealer and powder, I am really not happy with my skin. I have always heard that prevention is key, especially when it comes to looking after your skin and yes, I may be only 25 years old but that doesn't mean I don't have faint lines on my forehead or subtle lines near my eye area. Right now, I am not looking into skin treatments that involve injections but I am looking for high quality results to improve the quality of my skin. If I can start looking after the lines on my face now, it will certainly pay off when I am older, right? I was very excited to be introduced to the Fillerina brand. The Fillerina Filler treatment* is a Dermo-cosmetic Gel Filler and Nourishing Film that targets any fine lines on your face and neck. Pretty nifty huh? 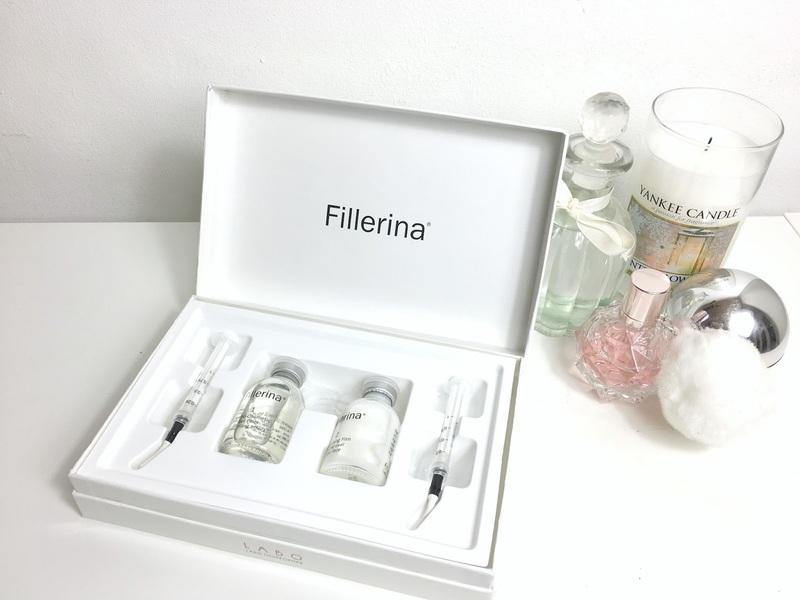 When I first opened the Fillerina packaging, I actually thought the kit included real syringes but after taking a closer look at the applicators, they are simply designed for accurate application. The high precision applicators allow you to apply the two products directly on the problem area, allowing the formulas to absorb into your skin. I was really impressed that you can apply the products directly to your fine lines on your skin, from your forehead, lips and even your eye area. After reading the instructions carefully and watching a few tutorials online, I removed the Gel Filler lid and I gently placed the applicator in the tube and extracted a small amount of the gel and I made sure I applied the product in a natural light with a big mirror so I could see the subtle lines on my skin. After leaving the gel to sink into my skin for 15 minutes, I simply rubbed it in (I gently patted the gel around my eye area because I know the skin is extra sensitive here) and then I applied a slightly larger amount of the Nourishing Film and rubbed this in.